The sadsadox regiment (sidtaps) and the gadsadox regiment (gidtaps) has twelve scaliforms each. These have more variety than the uniform versions since all of the uniform cases have 4800 octs. Most scaliform sidtaps or gidtaps doesn't have octs or may have a different number of them and therefore look very different from their uniform counterparts. They all have 3600 vertices. I noticed some of these as early as 1997 and counted them out in October 2005. Each regiment has five achiral cases and seven chiral cases. The last four of each regiment are non-orientable as well as saffix and gaffix, all others are orientable. The first three of each regiment are tame as well as sixfusix and gixfusix, all others are wild. These are in (or almost in) the sadsadox regiment. Safsadox - (SAFF suh dox / small fusisnub dis600) - cells are 1200 gads and 3600 'two-pip blend's. This is the blend of 10 sophis. Its verf looks like the blend of two staps. Safsixox - (SAFF sik sox / small fusisnub 600-600) - cells are 1200 ids and 3600 'two-pip blend's. This is the blend of 10 froxes. Saffix - (SAFF iks / small fusi600) - cells are 600 '2-sird-fusion's. This odd toroidal thing is the blend of 10 sriphis. It's verf is the blend of two stephenoids. Interesting note - this is not a snub! 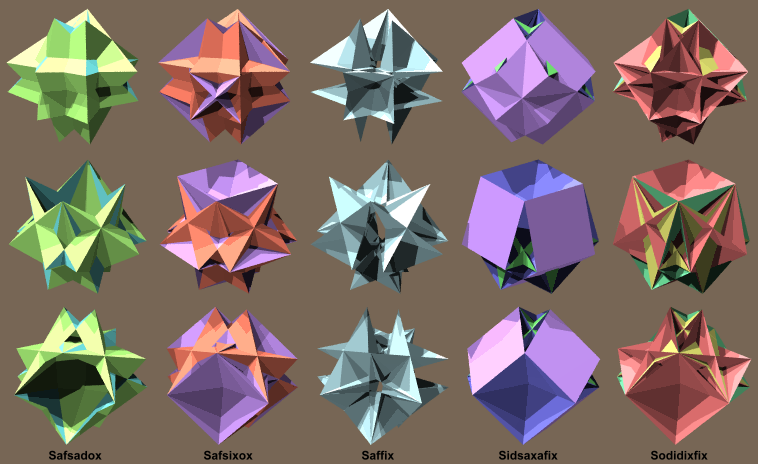 Sidsaxafix - (sid SAK sa fix / small disnub 600 fusi600) - cells are 1200 gads, 600 '2-srid-fusion's, and 4800 octs. This is the blend of 10 nipixadies. Sodidixfix - (so DID ix fix / small disdis600 fusi600) - cells are 1200 gads, 600 '2-srid-fusion's, and 1200 tids. This is the blend of 10 sirphinadies. It's not a snub. Sixfusix - (six FYOO zix / small 600 fusisnub 600) - cells are 600 gads, 600 ids, and 3600 'two-pip-blend's. This is the blend of 5 sophis and 5 froxes. Sasfusadex - (sas FYOO sa dex / small snub fusisnub dis600) - cells are 600 gads, 600 saddids, 2400 octs, 600 octs, and 3600 'two-pip-blend's. This is the blend of 5 sophis and 5 lifpipixhis. Sifstix - (SIFF stix / small fusisnub tris600) - cells are 600 gads, 600 ikes, 600 saddids, and 3600 'two-pip-blend's. This is the blend of 5 sophis and 5 paphinies. Sissixfix - (SIS six fix / small snub 600 fusi600) - cells are 600 gads, 2400 octs, 600 octs, and 600 'sird-srid fusion's. This is the blend of 5 sriphis and 5 nipixadies. Siddixfix - (SID dix fix / small dis600 fusi600) - cells are 600 ikes, 600 ids, and 600 'sird-srid fusion's. This non-snub is the blend of 5 sriphis and 5 som fapathis. Soxixfix - (SOK six fix / small 600-600 fusi600) - cells are 600 ids, 600 tids, and 600 'sird-srid fusion's. This non-snub is the blend of 5 sriphis and 5 sofapathis. Sofixadex - (so FIK sa dex / small fusi600 dis600) - cells are 600 gads, 600 tids, and 600 'sird-srid fusion's. This non-snub is the blend of 5 sriphis and 5 sirphinadies. These are in (or almost in) the gadsadox regiment. Gafsadox - (GAFF suh dox / great fusisnub dis600) - cells are 1200 sissids and 3600 'two-stip blend's. This is the blend of 10 quiphis. Gafsixox - (GAFF sik sox / great fusisnub 600-600) - cells are 1200 gids and 3600 'two-stip blend's. This is the blend of 10 ripahis. Gaffix - (GAFF iks / great fusi600) - cells are 600 '2-gird-fusion's. This odd toroidal non-snub thing is the blend of 10 graphis. It's verf is the blend of two stephenoids. 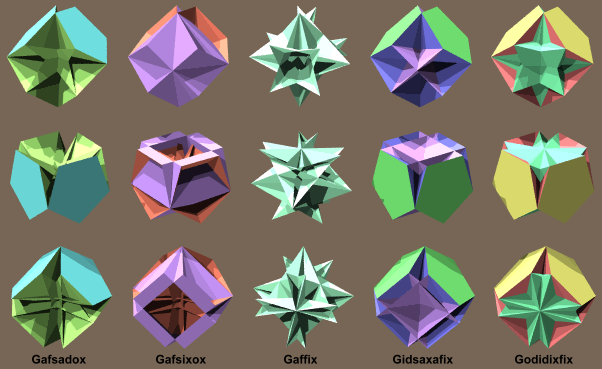 Gidsaxafix - (gid SAK sa fix / great disnub 600 fusi600) - cells are 1200 sissids, 600 '2-qrid-fusion's, and 4800 octs. This is the blend of 10 mif pixadies. Godidixfix - (go DID ix fix / great disdis600 fusi600) - cells are 1200 sissids, 600 '2-qrid-fusion's, and 1200 quit gissids. This is the blend of 10 gipdohinies. It's not a snub. Gixfusix - (gix FYOO zix / great 600 fusisnub 600) - cells are 600 sissids, 600 gids, and 3600 'two-stip-blend's. This is the blend of 5 quiphis and 5 ripahis. Gasfusadex - (gas FYOO sa dex / great snub fusisnub dis600) - cells are 600 sissids, 600 gaddids, 2400 octs, 600 octs, and 3600 'two-stip-blend's. This is the blend of 5 quiphis and 5 ofpipixhis. Gifstix - (GIFF stix / great fusisnub tris600) - cells are 600 sissids, 600 gikes, 600 gaddids, and 3600 'two-stip-blend's. This is the blend of 5 quiphis and 5 irp panadies. Gissixfix - (GIS six fix / great snub 600 fusi600) - cells are 600 sissids, 2400 octs, 600 octs, and 600 'gird-qrid fusion's. This is the blend of 5 graphis and 5 mif pixadies. Giddixfix - (GID dix fix / great dis600 fusi600) - cells are 600 gikes, 600 gids, and 600 'gird-qrid fusion's. This non-snub is the blend of 5 graphis and 5 gipathis. Goxixfix - (GOK six fix / great 600-600 fusi600) - cells are 600 gids, 600 quit gissids, and 600 'gird-qrid fusion's. This non-snub is the blend of 5 graphis and 5 gliffipathis. Gofixadex - (go FIK sa dex / great fusi600 dis600) - cells are 600 sissids, 600 quit gissids, and 600 'gird-qrid fusion's. This non-snub is the blend of 5 graphis and 5 gipdohinies. The following are conjugate pairs: swap first letter "s" - "g", i.e. saffix-gaffix.